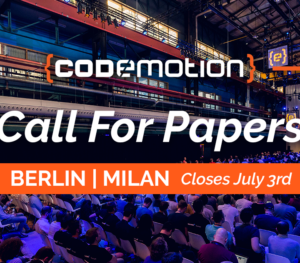 Codemotion Berlin 2018 Call for Paper is open. Don’t miss out on the opportunity to share your story and your expertise at the best tech conference in town. Apply now! We want to bring together top skilled professionals who like to think outside the box and want to understand the intersections of technology and programming: our call includes but is not limited to developers, designers, architects, startuppers, game developers, makers etc. Besides, we are really glad to receive proposals about future technologies, shaping the world of tomorrow. Submissions that do not fit into these categories are also welcome, provided that they are relevant or inspirational to the tech community. We appreciate proposals from first-time speakers: hence if you wish to apply but you never submitted before, drop a line to info@codemotion.it: our Advisory Board will be more than pleased to help you! We are really committed creating the most inclusive tech Conferences ever, hence we do support applications from underrepresented groups. Grab your chance to be onboard. Application deadline: July 3rd. Submit your proposal now!